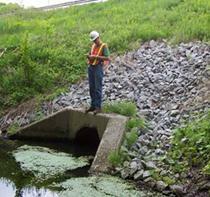 In accordance with the requirements of the Town's MS4 permit, Joe Casali Engineering, Inc. and staff will be performing inspections of approximately 94 outfalls located throughout the Town this week. Currently, we anticipate beginning this work as soon as mid-day tomorrow, Tuesday, June 27th, and continuing through the remainder of this week. Casali Engineering's site inspector will have business cards on him at all times to identify himself to any residents that may have concerns. Feel free to contact Maura Beck at 767-2200 x305 with any questions.